The soft voice of the monk filters through my concentration – “You must control yourself. Go to your breath. Observe it. Breath in, breath out. Discipline your mind. Don’t think about the past, don’t think about the future, stay in the present. Breath in, breath out”. 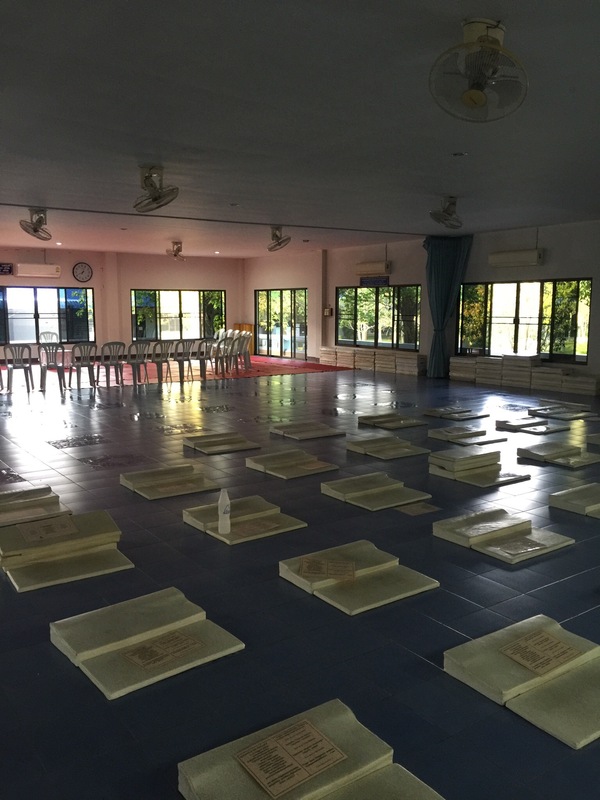 I am at the Meditation Centre of the Buddhist University Chang Mai campus, at the Wat Suan Dork temple for an intensive 2-day Meditation Retreat. 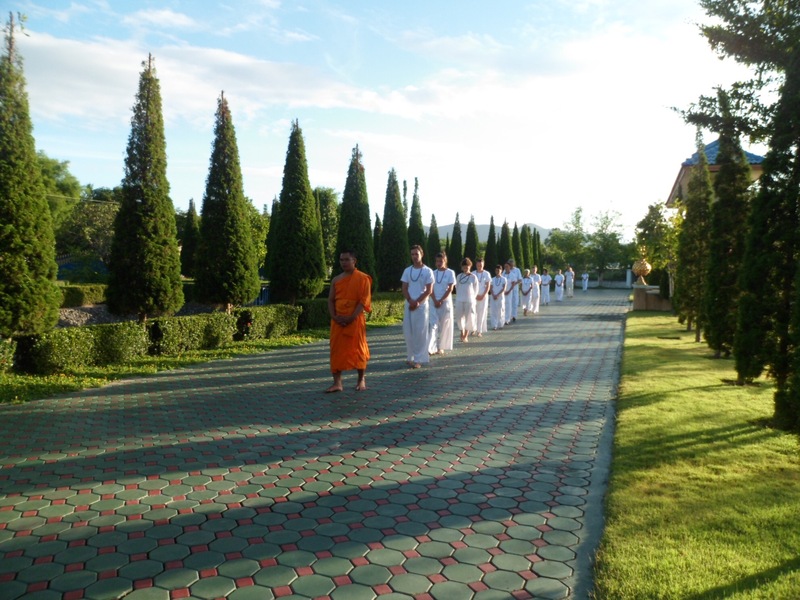 Our teacher, a Monk named Phra Simlapachai instructs us that we must be silent – to speak only if absolutely necessary. He tells us that Buddhism is not a religion; it’s a philosophy. Buddha was not a god, he was a man. The word Buddha means “Awakened One” or “Enlightened One”. They believe that there have been many Buddhas in the past and there will be many in the future. The present Buddha was born into a royal family in Nepal, near the border of India in 623 BC. Raised in luxury, he found that wealth did not guarantee happiness. He was deeply moved by the suffering of his people and resolved to find the key to human peace and happiness. He left the palace when he was 29 years old for a simple life of meditation and moderation. When he was 35 years old, on a moonlit night, sitting under a Bodhi-tree in deep meditation, all delusion and ignorance fell away and he understood the true nature of things, and became “Enlightened”. He spent the rest of his life (until he died at 80 years old), living simply, teaching about finding peace and happiness through mindful development, self-understanding, and spreading kindness and compassion; the basic premise of Buddhism. 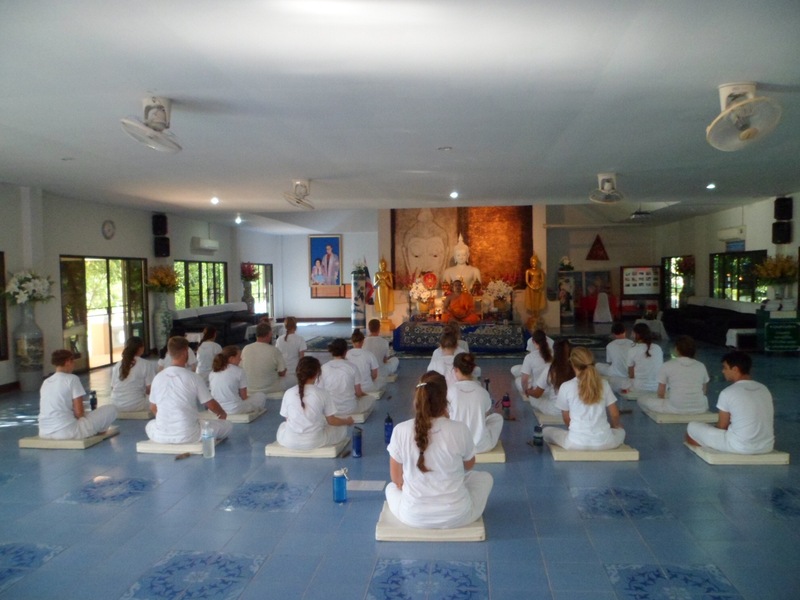 We begin each session by kneeling, hands in the the wai position (palms together at chest level, fingers facing up). 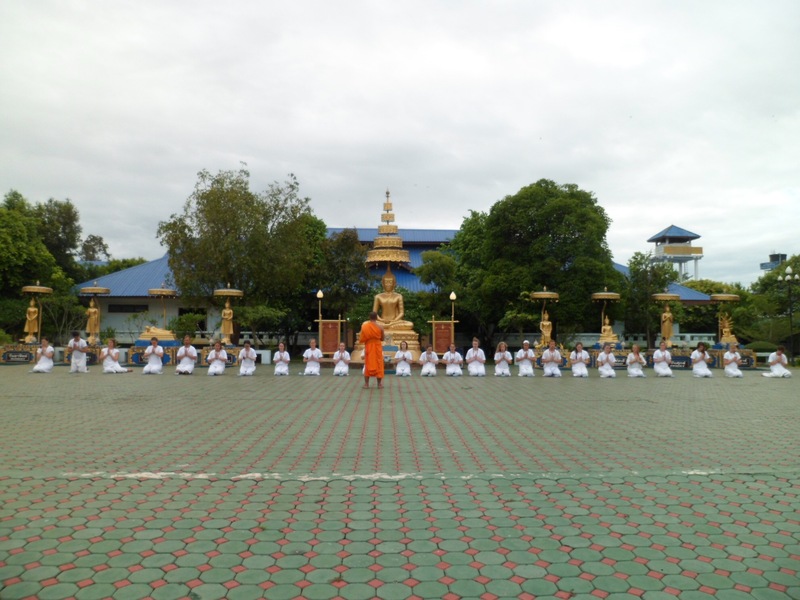 We bow our head to the floor three times in succession; in respect to the Buddha, to the Dharma (means truth), and to the Sangha (means followers of the Buddha). Between bows, our novice voices chant soothing unfamiliar words. Legs crossed, palms resting easy, we start to meditate. I concentrate on my breath but my monkey mind jumps from branch to branch. I bring it back to my breath, again and again. Before long, my side iches and my back hurts. “Let it happen and then try to detach”, Phra Simlapachai says. I observe the sensations, acknowledge them, and let them go. After hours of practice, many sensations have come and gone and I feel like I am floating a foot above my cushion. We are released from practice at 9:30 pm. Disciplining the mind is hard work and I sleep like a zombie until the 5:00 am gong. We have 15 minutes before we meet in the meditation room at 5:15. By breakfast at 8am (rice soup), we have already been practicing for almost 3 hours. We also practice walking meditation and laying meditation (during which I am shamed to admit, I fell asleep). We do alms – giving rice to the monk, and in turn, are blessed by him. Lunch is curried potato soup and rice. At the end of the second day, I am both exhausted and peaceful as I stuff my new white clothes into my pack. Regardless of belief, one unalterable truth has been hammered home – everything is impermanent and being able to let go with grace is an absolute necessity – and, in some aspects, that is a tough one for me to make peace with. But over my 2-day retreat, serenity and acceptance come. With patience and practice, I hope to hold onto it for awhile. The words of Phra Simlapachai echo in my mind, “Don’t think about the past, don’t think about the future. Stay in the present. Breath in, breath out”. What a great experience and definitely one to hold on to. It was definitely special and I am so glad I did it.